Even now, my boyfriend is what I describe as a “nerdy cowboy.” Social discomfort is not something he suffers from, but what he lacks in awkwardness he makes up for in his math degree and his desire to move to space. He never leaves home without a pen in the pocket of his pearl snap shirt. I love it. 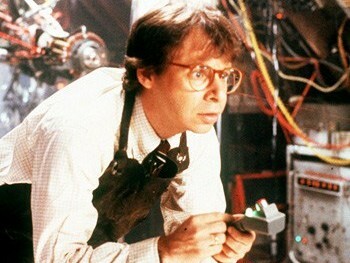 Before I met my nerdy cowboy, I used to dream of marrying Rick Moranis. When it wasn’t Rick, it was Harold Ramis. When it wasn’t Rick and Harold, it was Pee-Wee Herman, which kind of goes into a whole new territory of parental concerns for their child’s future. Yeah bro, I love Jeff Goldblum. And when I was a kid I used to pretend Egon Spangler was my boyfriend.